• User-Friendly: Ergonomic handle and additional legroom puts more distance between the shelves and you. You can push the cart more freely without hitting your shins and feet off the cart. • Convenient: The utility tray is roomy enough to store every day objects. 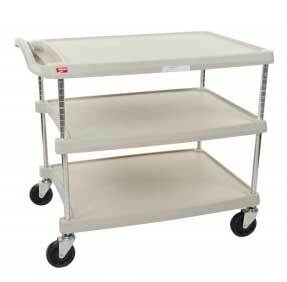 It offers 2x the amount of space than traditional utility carts; which allows for objects to fit in comfortably. 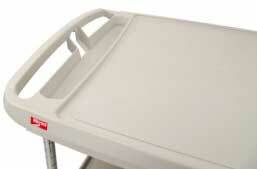 Personalized: Each cart comes with two labels for easy identification. • Ultimate Cleanability: Smooth polymer shelf surfaces with contoured edges are designed to resist staining and wipe clean easily. • Corrosion-Proof Shelves: All-polymer shelves will never corrode. • Sturdy construction:Impact resistant shelves are designed to withstand daily abuse. • Weight capacities evenly distributed: MY1627 and MY2030 models: 150lbs. (68kg) per shelf, not to exceed 300lb (136kg) on a 2-shelf cart and 400 lb. (181kg) on a 3-shelf cart. MY2636 Models: 200lbs. (90kg) per shelf, not to exceed 400 lb. (181kg) on a 2-shelf cart and 500 lbs. (227kg) on a 3-shelf cart. • Contains Spills: 7/16” (11mm) ship’s edge retains small spills and prevents items from sliding off during transport. • Specific Models with Microban® product protection: The blue MyCart has built in Microban® product protection. This inhibits the growth of bacteria, mold, mildew, and fungi that cause odors, stains, and product degradation. • Easy-to-Adjust:Optional center shelf adjusts on 1” (25mm) increments. •Easy, No-Tool Assembly: Ships knocked down. *MICROBAN® and the MICROBAN® symbol are registered trademarks of the Microban® Products Company, Huntersville, NC.